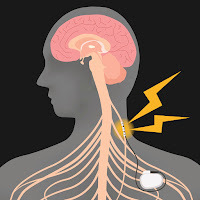 Adjunctive vagus nerve stimulation (VNS) can lead to better five-year clinical outcomes in patients with chronic, treatment-resistant depression, reports a study published March 31 in AJP in Advance. These findings provide the first long-term evidence of the benefits of VNS. VNS, which involves delivering electrical impulses to the vagus nerve via an implanted generator, was approved for treatment-resistant depression in 2005. As part of the approval, the Food and Drug Administration required a postmarketing surveillance study, which led to the formation of the Treatment-Resistant Depression Registry. The registry is an observational program carried out at 61 sites across the United States that has monitored a large cohort of patients with treatment-resistant depression for five years each. There were 795 study participants. Treatment resistance was defined as ongoing unipolar or bipolar depression that lasted at least two years or recurred at least three times and failure on four or more depression treatments, including maintenance pharmacotherapy, psychotherapy, and ECT. Within the group, 494 patients received periodic VNS over five years in addition to usual treatments, and 301 received usual-treatment only. The Montgomery-Åsberg Depression Rating Scale score was used to assess clinical outcomes, with response defined as a decrease of 50% or more from a patient’s baseline score, and remission defined as achieving a MADRS score of 9 or less. The patients in the VNS group showed a five-year cumulative response rate of 67.6%, which was significantly higher than the 40.9% response rate in the usual-treatment group. Compared with treatment as usual, patients receiving VNS also had a shorter time of first response (12 months vs. 48 months) and a higher remission rate (43.3% vs. 25.7%).